Hermetic sealing is the process of creating a container of some sort that is airtight. That means that any material in the container, whether it's a gas, liquid, or solid, will not leak from the container. Hermetic sealing is commonly used to encase electrical mechanisms, as well as to contain functional gases. There are many different types of airtight seals that have various applications depending on the industry it's being used for. These types of seals are used when joining glass to a metal surface, hence the name glass-to-metal. Often used for common household items such as halogen or neon light bulbs, the process seals the glass to a metal surface to contain the gas. There are two types of glass-to-metal seals; which process is used depends on the type of materials being used. Matched Seals: Used in light bulbs mainly, matched seals are formed when the glass and the metal have the same coefficient of thermal expansion. The seal's strength is sourced from the bond between the glass and the formations of oxide on the metal. This type of seal tends to be weaker since it cannot withstand high-pressure fluctuations between the two materials. Compression Seals: These seals are the stronger of the two and can withstand high-pressure differentials and types of physical stress such as shock. Alternatively to matched seals, compression seals take place when the coefficients of thermal expansion are different and therefore the metal forms around the glass. This seal is a high-pressure alternative to glass seals and is often used in applications that put large amounts of stress on the seal itself. Epoxy resins are often used in vacuum seals and are commonly used to seal copper, brass, and other materials. They allow for more design flexibility but have a much smaller window of temperature variation and therefore epoxy seals are only feasible in certain applications. 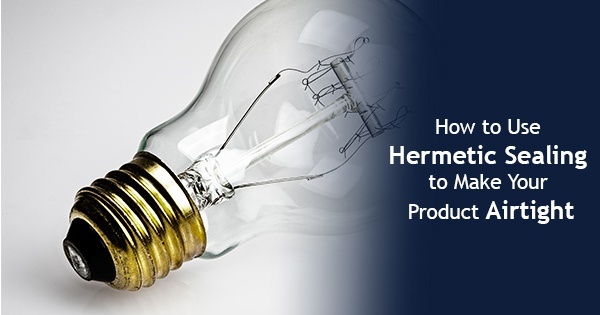 For many hermetic seals, the operator can use induction heating to create the seal depending on the application. Induction is a form of non-contact heating and is used in processes with a temperature variance of between 212 and 5432 degrees Fahrenheit. Much like hermetic sealing, induction sealing and induction cap sealing are used to seal containers, albeit in a much more temporary way. These types of induction heating are commonly used for applications such as tamper-evident seals as well as cap sealing for the medical industry. If you're looking to use EASYHEAT induction systems for your heating needs, contact us today at sales@ambrell.com for further information.